● Kyle Busch started fourth, finished first. ● After starting from the fourth position, Busch jumped to third early and made his way to the second spot in his No. 18 Interstate Batteries Toyota by lap 12. ● Busch took over the top spot on lap 13, and only briefly relinquished the lead when he pitted on lap 31 for four tires and fuel. ● Once returning to the track, the driver of the No. 18 Interstate Batteries Toyota again took over first with 28 laps to go. ● A late-stage caution on lap 56 brought the Toyota down pit road for four tires and fuel, and Busch maintained the top spot at the conclusion of Stage 1. ● Started first, finished first. ● Busch dropped briefly at the start of Stage 2, but within three laps he was back to the top of the leaderboard. ● Green-flag pit stops started, and Busch brought his Toyota Camry down to pit road for four tires and fuel on lap 92 but managed to return to the track in the first position. ● Busch finished the second stage in the first position and reported he had gotten tighter the last 10 laps. 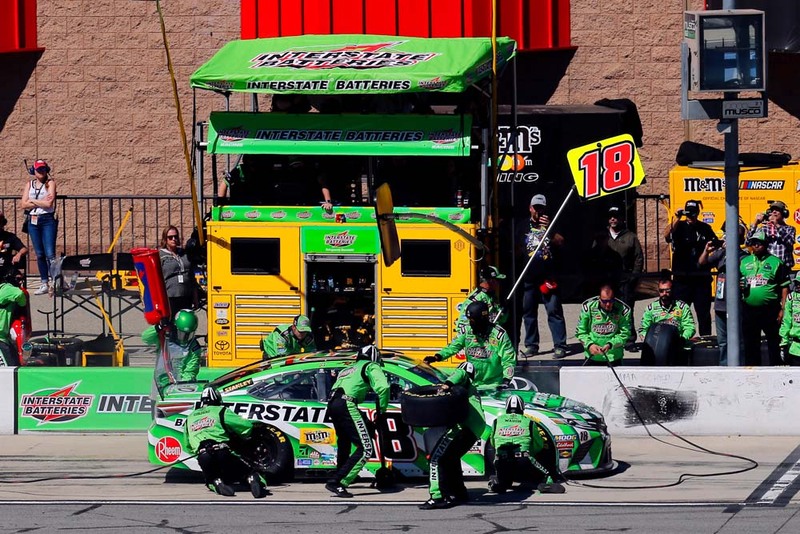 ● The Interstate Batteries team went to work at the end of Stage 2, adjusting the air pressure, changing four tires and adding fuel. Unfortunately, a speeding penalty when returning to the track dropped him to the tail end of the lead lap for the start of the final stage. ● Started 18th, finished first. 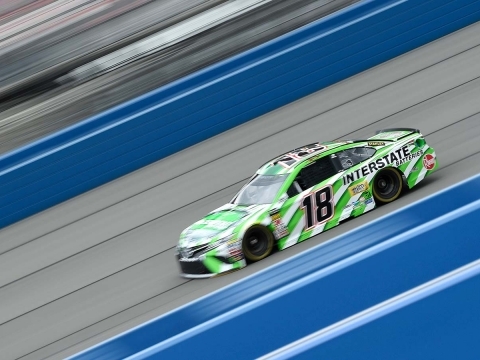 ● At the start of the final stage, Busch and the Interstate Batteries team had some work to do to get back to the front of the field, but it was evident quickly they were up for the challenge. 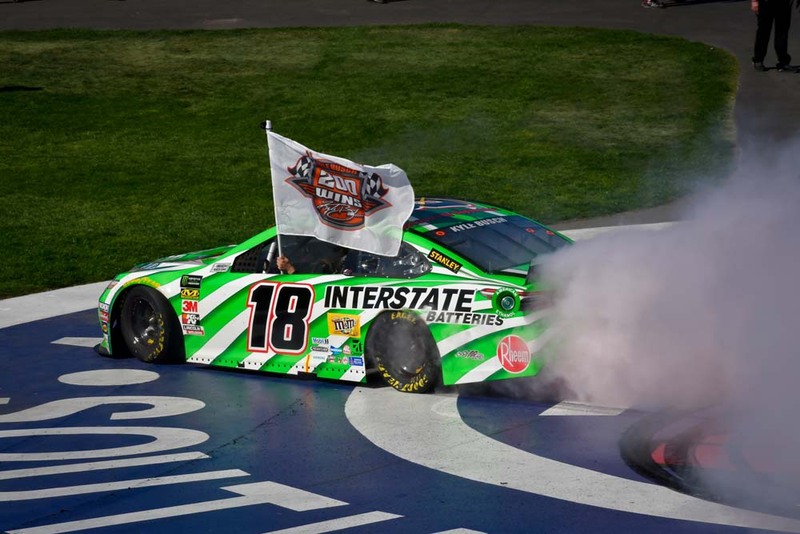 ● The 2015 NASCAR Cup Series champ sliced his way through the field, moving up to 12th by lap 133, back into the top-10 by lap 137 and all the way up to fourth as green-flag pit stops began for the final time. 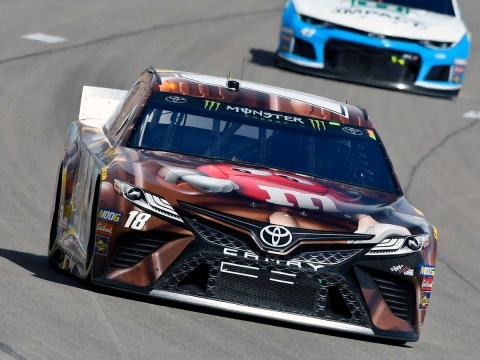 ● As the laps wound down, while Busch sat in fourth, he was almost eight seconds behind the leader and needed a break to gain back the track position that was lost on the pit-road speeding penalty. ● Busch got the break he needed on lap 163 when the caution waved for debris. He came to pit road for four tires and fuel for the final time on lap 165, and the Interstate Batteries crew quickly returned Busch to the track as the first car that pitted. 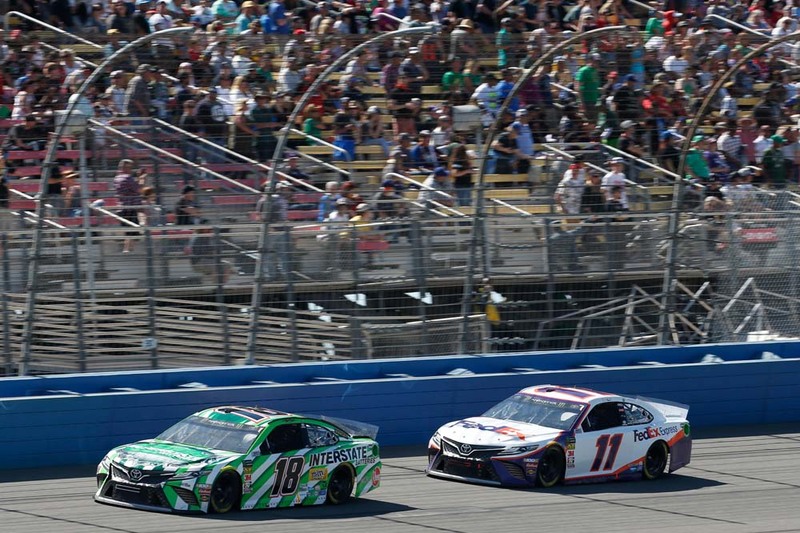 ● Busch lined up second on the final restart behind Ryan Blaney, who did not pit. On that restart, Blaney’s Team Penske teammates Joey Logano and Brad Keselowski slipped ahead of Busch. It didn’t take Busch long to gain his footing, passing both Logano and Keselowski at the exit of turn two on lap 175, and he never looked back, bringing home his 53rd career Cup win and his impressive 200th overall race win among NASCAR’s top three series. 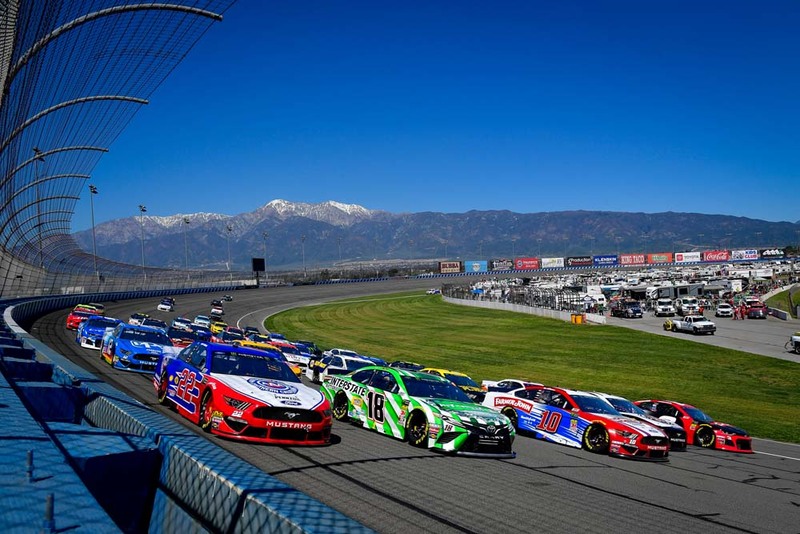 ● Busch won the Auto Club 400 to score his 53rd career Monster Energy NASCAR Cup Series victory, his second of the season and his fourth at Auto Club Speedway. His margin of victory over second-place Logano was 2.354 seconds. ● Busch led seven times for a race-high 134 laps. ● This is Busch’s fourth top-five of the season and his 10th top-five in 21 career starts at Fontana. You finally did it. It’s complete. How does 200 feel? When that speeding penalty happened, what was going through your mind? Did you think your chances of winning this race and getting to 200 were maybe over? Do you pay attention to various milestones other than this number 200 accomplishment? Next Up: The next event on the Monster Energy NASCAR Cup Series schedule is the STP 500 on Sunday, March 24 at Martinsville (Va.) Speedway. The race starts at 2 p.m. EDT with live coverage provided by FS1.